"Sonic the Hedgehog FCBD 2013"
Sonic the Hedgehog FCBD2013 is Sonic's 7th FCBD issue, it's the prelude to Worlds Collide. Mega Man pursues Break Man while on Rush Jet. During the fight, Rush is shot down with Mega Man setting up to teleport him back to Light Labs. Holding off Break Man are Light Robot Masters Bomb Man, Guts Man and Cut Man, while Mega Man fixes Rush's transponder, then teleports him out. The three Robot Masters are easily defeated, leaving only a battle between Mega Man and Break Man. During the battle, Dr. Wily leaves the Lanfront Ruins through a mysterious portal. Break Man is about to destroy Mega Man, while the latter pleads that he doesn't destroy the integrated circuit as it would break Dr. Light's heart. Break Man then backs down and tries to retreat, only for Mega Man to catch and attempt unmasking him. The outcome was interrupted as the world faded to white. 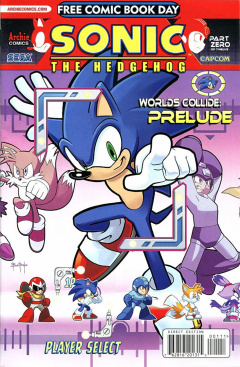 Sonic & Tails on the cover are seen in their Advance poses, Blaze is doing her Rush pose and Mega Man is doing his main pose. This page was last edited on 20 October 2018, at 19:48.